We’ve gone through the first week. The governor and the state-wide officials have all been inaugurated, I fit into the same tuxedo I got married in 23 years ago for the inaugural ball, the Senate is in uproar about Senator Tom’s defection and the consequent change in partisan control, the sun came out (briefly) in Olympia, and we are back to work. The only real surprise to me was the tuxedo fitting. The Senate is controlled by Republicans due to Democratic Senators Rodney Tom and Tim Sheldon caucusing with them. Sen. Tom is the “majority leader” and Sen. Sheldon has a leadership role. I’m not sure how this will work out in the end but it’s gotten a lot of press. We have successfully negotiated a bipartisan budget for the last two years that I have been budget chairman, and I expect that to continue. The change in control of the Senate does not affect the budget as much as you might expect. It may have a profound effect on issues like women’s healthcare, gun safety and those that have more partisan differences of opinion. I am withholding judgment until the end of the session and we see how things work out. We have three big tasks this year that we must complete, plus a few additional projects many of us would like to get to if we complete the important work. Resolve the supreme court’s requirement in the McCleary case that we live up to the constitutional requirement to “amply provide for the education of all children.” Current estimates are that this will require about $4.5 billion every two years by 2018, and we must make “steady progress” towards meeting this goal. Work out all the details of the Medicaid expansion enabled by the federal Affordable Care Act (Obamacare.) This will cover nearly 350,000 additional people in Washington and save the state over $100 million a year. The health insurance exchange will cover an additional 400,000 or so people, leaving almost everyone in Washington covered. I’d like to adopt a transportation package that finishes the funding for the West end of the 520 project and invests in other important transportation infrastructure, but this should come after we address the base budget issues and McCleary. I’d also like us to take reasonable steps forward on gun safety in light of the recent spurt of mass killings, but this will be difficult as there are substantial differences between members on the issue. Perhaps the US Congress will be more functional than the Legislature on this topic, but that would be a real surprise. This newsletter is made up of several recent blog postings I’ve done. If you’re interested in the topic you should be able to click through to the website to see the rest of the article. I find that if I share everything I write with you that the parts at the end don’t get read. Perhaps I should take this as a sign, but I can’t help myself. For more posts that didn’t fit into this newsletter, and the stuff I post during session you can read my website. The current economic outlook calls for modest growth, but growth in tax revenue slower than our obligations. 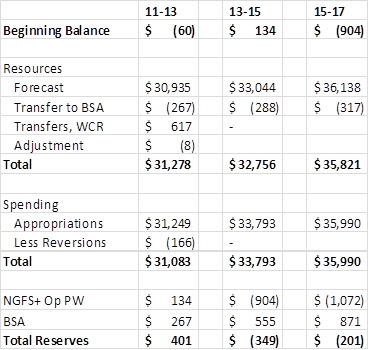 Our current projections show a shortfall of $904 million in the 2013-15 budget. The cryptic “NGFS + Op PW” title in the spreadsheet stands for “Near General Fund plus Opportunity Pathways” accounts, and is the sum of most state taxes that go into the overall budget. “BSA” stands for “Budget Stabilization Account” or the rainy day fund. We can’t spend this fund without a super-majority vote, so the problem is $904 million, not the $349 million on the bottom line. Many changes will happen to this budget before we are done, including the addition of the McCleary obligation. Adding all the problems together nets you about a $2.8 billion problem. On the Legislative side the Joint Task Force on Education Finance report issued in December 2012 detailed an eventual cost of about $4.5 billion dollars per biennium in additional funding needed to meet the court’s definition of “constitutionally adequate.” Arguments that the court isn’t talking about funding are belied by the quote above. Despite protestations to the contrary, this session the Legislature needs to make steady progress towards completely meeting the court’s requirement by 2018. There are 5 school years between now and 2018, and “steady progress” means we get about 2/5ths of the way to the complete solution, or about $1.7 billion. I personally do not believe that just adding additional money to the system will resolve all the problems we face, particularly with respect to the achievement gap faced by many low-income students. The funds are necessary, but probably not sufficient to improve matters significantly. The same can be said about the proposed accountability changes. I believe we can do both, and have significant results. There will be much negotiation this year to come to a resolution. For more information read What’s in McCleary? I’ve held off commenting on gun safety because I wanted to think about it for a while after the Sandy Hook incident. Writing new policy in knee-jerk response to a single incident typically is a bad idea. However, there have been enough incidents that I think we need to respond and create a safer place to live. I have already received a lot of email on this issue and I try to address most of the issues that have come up. These are addressed in the actual blog post – there have been a LOT of issues raised. Some people think about this issue from a “rights” perspective – “I have a constitutional right to own whatever kind of firearm I want” and some from a public health perspective – “it turns out to be a bad idea to let people with unresolved mental health problems or domestic violence issues, felons, and children own dangerous weapons.” We can balance these two perspectives in reasonable ways. Ensure that people with domestic violence restraining orders, mental health issues, etc. are unable to purchase guns by requiring background checks on all gun purchases, including those at gun shows. Keep guns out of the hands of small children and other unauthorized people by creating some kind of “safe storage” requirement. If you are going to keep a gun in your house or car you should be responsible to ensure that children do not have access to it. Reduce the availability of military capacity guns that can fire many rounds very quickly. This is an extension of the principle we use in banning the private ownership of machine guns, bazookas and tanks and would fall under the supreme court’s definition of “unusual and dangerous” weapons. I believe this is a problem that can best be addressed at the federal level, not at the state level. I have no detailed knowledge of Sen. Feinstein’s bill or President Obama’s proposal and cannot comment on the specifics other than to say that it is an issue in the other Washington, not this one. And, on a more personal note, I would feel more secure if most people (including elected officials, but not the numerous state patrol officers stationed at the capitol) were prohibited from carrying firearms on the floor of the House. A surprisingly large number of people who are not off-duty police officers feel a need to carry concealed pistols in a building filled with children, tour groups and sometimes angry protesters. The likelihood of accidents seems high. For the much longer post read Gun Safety in Washington. The forum will allow residents to learn more about competing visions for funding public education in Washington. During the event, participants will hear about the current budget shortfall, the costs associated with meeting the McCleary decision by 2018 and a comparison of the different legislative approaches to address the issue. The forum is free and open to the public. Please register by emailing info@educationvoters.org. There will be more of these events.